Last year, I featured a not-so-traditional spin on a classic Irish dish, cottage pie. 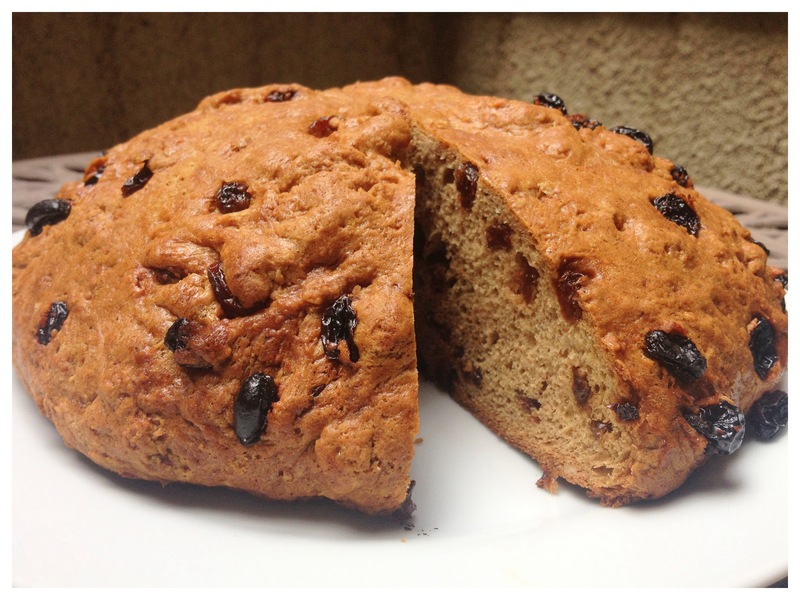 This year, I decided to tackle another traditional dish and put my own spin on it, Irish soda bread. When I decided to make the dish I also decided that it must be both gluten and dairy free. Why did I decide this you ask? 1. I have quite a few gluten intolerant people in my life 2. Like most people, I am finding that as I age I am becoming more and more lactose sensitive/lactose intolerant 3. I like the challenge. When I was researching and then coming up with this recipe I learned a few interesting things. No kneading necessary, try to handle the dough as little as you can. Just make sure the ingredients are incorporated but other than that LEAVE IT ALONE. The typical “mix-ins” for this bread are raisins and/or currants, but many people add savory items like cheese, herbs, olives, onion, and sun-dried tomatoes. I chose to stick with raisins because my desired meal to enjoy this bread is breakfast and to me raisin bread equals breakfast (I try to only have breads and other direct sources of carbohydrates in the morning). The cross you are suppose to imprint onto the top of the dough before baking serves not only a spiritual purpose like “letting the devil out of the bread” or symbolizing a thank you to God but it serves a scientific purpose too. The cross also allows the heat to penetrate the thickest part of the bread. When baking bread with “gluten free flour” choose “gluten free bread flour” not “gluten free all purpose flour”. I made this mistake and failed miserably, the bread wouldn’t rise. It’s best enjoyed with a dollop of Nutella or even a scoop of your favorite jam while sipping on your morning cup of coffee. Prepare baking pan with non-stick cooking spray or a Sil-Pad. Combine ingredients then pour in raisins and mix until incorporated. Be careful do not over mix. Bake for 25-30 minutes (watch for “doneness”; when a knife can pierce the center of the loaf and come out clean), then allow to sit for 10-15 minutes before serving.